Our Video shows the Apartment, Resort and Region, it is 3/49 in the above gallery. First floor with extra large L-shaped balcony which doubles the living area. On balcony - outdoor sofa and easy chairs (new 2019), loungers, breakfast area with 4-seater dining table and chairs. Spectacular open views over the lake, 11th green, and golf course. Excellent security - controlled access, secure perimeter fence with CCTV surveillance, 24/7 patrols. Hacienda Riquelme is spacious, quiet, and beautifully maintained. All buildings are traditional Spanish style. The club house and centre is based on the beautiful historic manor house - 'El Cason' - with an excellent restaurant, bars, pizzeria, large Spar supermarket, and golf pro-shop. Just 20 minutes to the Mar Menor with miles of clean, very safe beaches (perfect for children) and traditional 'low-rise' villages along its coast. The lively small town of Sucina is just a 5 minute drive away and has lots of bars, restaurants, cafes, take away, and shops. There are 20 superb swimming pools throughout the resort so they are never crowded, and the nearest is just a two minute's walk away. Sports facilities include tennis courts, outdoor gym, short tennis, boule pistes (steel boule in apartment for you to use), driving range and a practice area (2 sets of clubs in apartment for you to use). The outer road of the resort is an ideal running track for fitness enthusiasts. There are many golf courses nearby including five more in the GNK group, where you can get discounted green fees. Marilyn and I are are both recently retired, Marilyn from a lifetime of teaching, and me from a long career as a car designer and a shorter career as a Design and Technology teacher. Marilyn still keeps very busy directing plays and musicals, learning Spanish, keeping fit and working with charities. I will now have more time for playing golf, riding my bike, windsurfing, skiing, painting and, of course, coming out to Hacienda Riquelme. 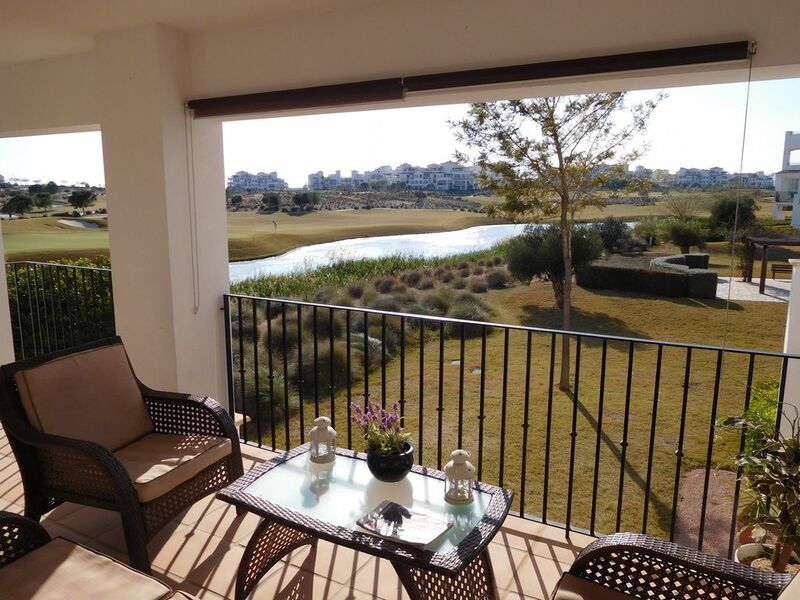 We chose our apartment on Hacienda Riquelme for the spectacular view, and we never tire of sitting on the balcony and watching the golf in the day and the sun setting across the lake in the evening. We love Hacienda Riquelme and think that it is a very special place; spacious, peaceful and beautiful. We also love the Mar Menor beaches, and the fact that this part of Spain is largely unspoilt and that there is so much to do in the region. EXTRA SIZE --- All the apartments on Hacienda Riquelme are virtually the same size, but the balconies are different. Our balcony is one of the few L-shaped dual aspect balconies and it doubles the living area (it is 4x the size of the smallest balconies). It makes the apartment very relaxing and spacious. VIEWS --- Stunning views over the lake and open views of the golf course and a 'gallery' view over the 11th green where there is always something to watch. EXTRAS we provide --- Loungers, parasol, lilo's, etc for the pool. Beach chairs, parasol, buckets/spades, boule, etc for the beach. In the apartment there are extra shelves, cupboards, chest of drawers, hairdryer, extension lead with UK sockets... everything we can think of to make your holiday as good as possible. INFO BOOKS - 'Apartment Information' -- shows how everything in the apartment works, plus TV channels, WiFi login, emergency phone numbers, and information about the resort. - 'Things To Do & Maps' -- shows our recommendations for the best restaurants, bars, beaches, walks, and interesting places to go, plus maps of how to get to them. Our guests have been very complimentary about how helpful this has been in discovering and enjoying this lovely region. Under-basin cabinet. Heated towel rail. Extra shelf for make-up etc next to basin. Lounge - new (2018) high efficiency unit with remote control. Bedrooms - individual units with remote controls. Lounge - new A/C unit is also a quick acting heater. Radiators - in all rooms. Central Heating Boiler - gas fired but outside in OPEN AIR balcony for safety. Washing machine is in the balcony-type utility room for convenience and quietness. Basement garage plus roadside parking for short stays. Easy parking at El Cason resort centre for Spar shopping and restaurants. Basement garage is secure and keeps your car nicely cool. Remote control for access. Lift to all floors. Coffee, tea, sugar provided for you on arrival. Various condiments etc in pantry. Full set of crockery, glassware, cutlery, and cooking utensils. Separate kitchen is bright and airy: cooker, hob with extractor, fridge/freezer, microwave, dishwasher, toaster, kettle. Iron and ironing board are kept in a separate cupboard in bedroom 2, to keep the kitchen un-cluttered. Outdoors - large round table and 4 chairs on the balcony in the south facing breakfast area. Indoors - round glass table and 4 chairs in the corner of the lounge. 32in LED screen (2017), great picture. DVD player and some popular DVD's including family and children's favourites. Some popular novels plus 'coffee table' books for browsing. Small selection of games for children. Two courts in the sports area, 5 minutes walk away. Two rackets for you to use. Also short tennis glass-walled courts in the sports area. Lift from basement car park or entrance level. Wheel chair accessible with flat floors inside ramp paths outside. Meet and Greet available - our key holder will meet you at the gatehouse and familiarise you with the apartment (15euro charge for this service). Self Check In also available - collect key from key safe on the apartment building entry door. Chairs, parasol and loungers to take to the pool. Chairs, parasol and loungers to take to the beach. High chair - no charge. Cot available - small charge. There is a charge of 60 Euros for cleaning and laundry to be paid locally. Good meet and greet, lots of helpful info about the area. Clean and excellent Apartment in a beautiful and well cared for golf resort. A really good location for touring this lovely area of Spain. Clean simple flat with usual equipment including beach loungers sunshade etc comfortable but plainly decorated which is understanding for a rental property. Key holder Jill very helpful. A nice tranquil resort with a very good golf course and loads of golf nearby. Ten minute walk to clubhouse and restaurant. We are pleased that you appreciate the light and neutral decor which we have designed to be tasteful and modern. We believe that we provide more than the usual level of equipment and facilities for our guests and we have often been complimented on it. Thank you for your helpful comments about the golf. Having stayed at HR on many occasions prior to this visit, we already new the area and the resort, so was as expected.Our stay was 22 nights, with 2 adults and 2 children. The apartment itself in my opinion could do with a little bit spending on it to label it "luxury" - To list small issues like Hall way mirror chipped, very suspect wiring to the lamp in the lounge, rusty bathroom radiator, door locks not working, front door handle needs replacing, veneer on the bathroom unit is well worn,the outside furniture has seen better days, and could do with an updated WiFi router. So is essence I'm saying just needs a little TLC and this apartment would be back to the level advertised. Now the good bits - The owner was excellent, at time of booking, and with updates and info.being on the first floor gives you the privacy and the Vista is fantastic...close to the pool which even in peak season was quiet. we had an issue with the bedroom aircon, and if was sorted within 24 hours which shows the owners value the property & its guests. Would I stay here again - YES, all in all was an enjoyable stay, and great value for money. Thank you for your positive comments, particularly about wanting to stay again in the future. We have repaired the door handle and acted on your other comments. We believe that the apartment represents outstanding value and we strive to give our guests a great holiday. Quite peaceful location with wonderful views! We had never been to this region of Spain before but were looking for something different. We certainly found it. Paul the owner always replied to our queries promptly. The apartment was really spacious and well equipped. The golf resort was well kept and very secure. Club house excellent with good food and service. Several good places to eat in Sucina. Thanks to Jill for recommending the 1.39 wine from the local supermarket! Well worth trying. The beaches in the area are amazing. Our favourite would definitely be Lo Pagan. All in all a brilliant holiday and would certainly visit again. Cheapest flights can be booked with our flexible changeover days (eg Tuesday - Tuesday). Corvera airport is just 30 min away with direct flights from RyanAir, EasyJet, etc. Hire car picked up at the airport. Alicante airport 60 min away by easy Motorway-type roads and has more flights, so can be even cheaper. Detailed map will be sent to you giving clear instructions of how to get to the resort. Sucina, 5 min drive, is the nearest small town with lively bars, lots of restaurants, cafes, and several handy shops. Murcia City (30min drive) has a fine cathedral, lots of lovely plazas and the wonderful 'Casino' a palace with rooms in the styles of European palaces and cheap entry price. Cartagena (30 min drive) has fine a Roman amphitheatre and museum and a wealth of history, it has an attractive port (cruise stop-over) and has an interesting labyrinth of ancient backstreets. At the top of the Mar Menor (20 min drive) are the popular mud baths at Lo Pagan where you can experience this health spa treatment for free and rinse off in the Mar Menor. Eating out - Hacienda Riquelme resort has an excellent, reasonably priced restaurant in the historic and beautifully restored 'El Cason' mansion house. There are a good variety of restaurants in nearby Sucina and many, many more in the towns along the shore of the Mar Menor. For a special occasion there is the truly excellent (but still reasonably priced) and unique 120 year old 'La Encarnacion' restaurant on the sea front in Los Alcazares. And why not eat right on the beach at a superb fish restaurants in La Ribera, an unforgettable experience. All the beach bars on the Mar Menor promenade have superb Tapas. The book in the apartment has details of all our favourite places to eat including a choca-holics dream cafe in Cartegena, best value all-day breakfast by the beach, chill-out bar watching the kite-surfers, best Tapas bars, excellent Indian restaurants and as many authentic Spanish restaurants as we can find... we visit as often as we can to continue the research for you! Booking Notes: A deposit of 50% is required to secure your booking, with the balance being payable 2 months before your holiday arrival day. A £100 security deposit is also required with the balance. This will be returned within two weeks of your departure subject to a satisfactory check-out. Additional Charges - Cleaning/laundry is paid locally and is 60 euro. - An optional Meet and Greet service is available and is15 euro paid to our key holder in the resort. (Self Check In is also available using a key safe set with a unique code for you. This is no charge) Changeover Day: Flexible changeover days to help you get the best value flights which are often mid-week. Check-in time from 4pm, check-out time 10am. Notes on prices: Prices are for the apartment per week in UK pounds. Minimum stay is 7 nights. Cleaning is charged separately and is 60 euro, paid locally. Discounts are available for longer stays - please contact us for a quote.